Aren't these the cutest little jars you've ever seen? I picked them up at the dollar store (Dollorama) last night and they're just a touch bigger than a can of pop (errrrr, soda for my American friends!). They were only $1.50 and I snapped up 4, but now I'm wishing I got more. As soon as I got home I felt the urge to design these little cuties their own labels. I settled on this quatrefoil/Moroccan tile/clover design (seriously, what is this shape?) and some lovely new fonts I just added to my collection. I have a bit of a crush on the 2012 pantone colours so decided that I needed to incorporate those colours. Of course, I can't stay away from my vintage blue, so I created those as well. I still can't decide which I like better. So for now, they have both labels and I can just give the jar a lil 180 and switch up the look! Fun, hey? Well, what's even more fun is that you can download these minis for free! Who doesn't love free stuff? I know I do. And if you print them up and love them so much that you'd like to do your entire pantry, well lucky you- I will be listing these on my etsy shop The Paper Society very very soon! 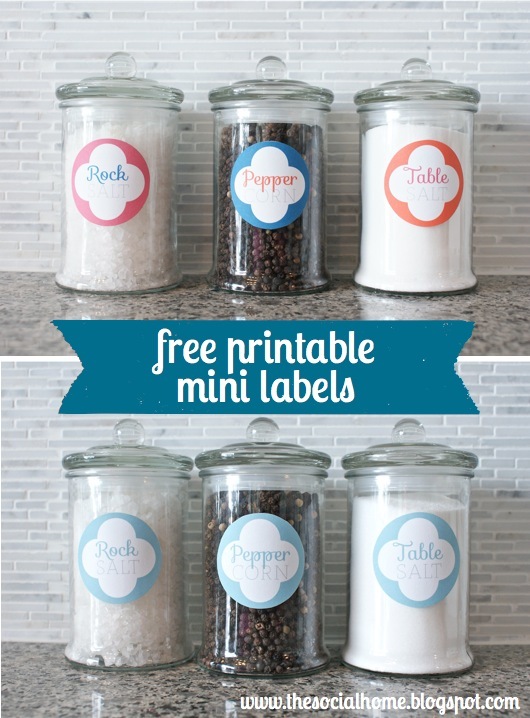 To download your free labels, click HERE! I just recently found your blog-and I LOVE it! Your home is so beautiful, and I will admit that I love that you are a fellow Canadian also. I am really digging all the cute storage jar posts and the labels as well. I can't wait to see some more pictures of all your updates-keep them coming! Thanks so much Deena! I also love reading Canadian blogs... just makes everything seem a little more close to home! I found your blog through I Heart Organizing and you have been such an inspiration to be able to do all the "fun" things in my home on a more than reasonable budget. Thank you! I had a question. 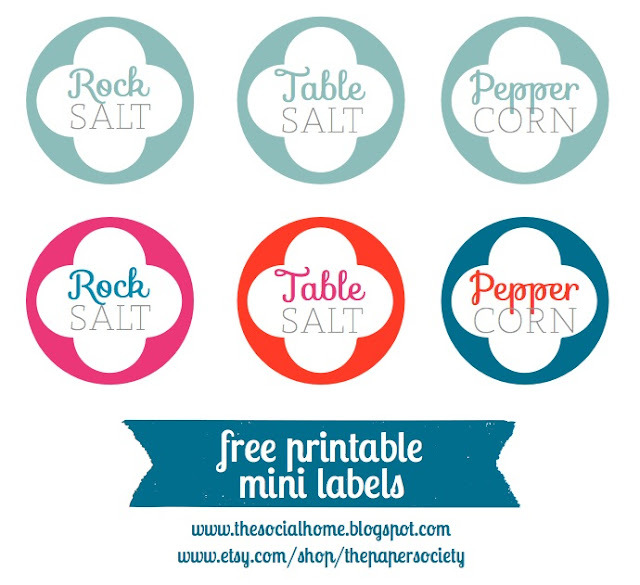 Do you print your labels on sticky paper? Or do you glue them on? I've been trying to figure this out. Haha. Thanks in advance! But to quickly answer- yes I mostly use full page mailing labels from Staples. Sometimes I just use a nice and thick cardstock and use a glue runner to adher, or laminate it first and then use the glue runner. Hi there! Found you through Pinterest. 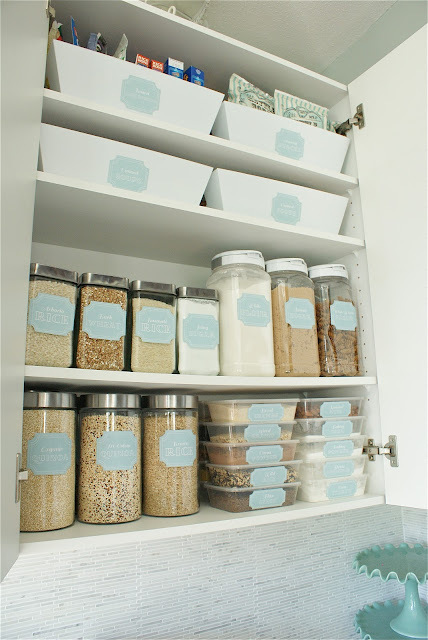 Your pantry turned out amazing! I'm completely inspired to do my own now, thank you!!! I'm now your newest follower, come say hi sometime! Just wondering what fonts did you use on these labels? They are totally adorable! That would be Sofia and St.Marie! I too am a dollar store shopper. I buy jewellery, christmas decorations, mugs, creams, and pillow covers. I would love to send you picture of what I have from the dollar store. Don't know how to send on your web page. Beautiful! Maybe its just me but I NEVER find cute stuff like this at the dollar stores near me (I live in Michigan). Dollar General and Dollar Tree near me have nothing when it comes to glass or even plastic canisters of any size. I need to find new options. I've checked TJ Maxx and Home Goods and they have offerings but problem is, if you need 20 canisters you have to hope 5 other TJ Maxx's will have them and then you are driving around like a crazy person trying to score a few hear and there. (But the hunt can be fun too!). But the other problem is, if you need a few more in the future, forget it because when you go back they won't have them anymore. I'm on a mission though to find affordable containers that won't be discontinued or impossible to find within a month! Thanks for the inspiration. Your house is beyond amazing. Your colors=my dream. But I live with someone who doesn't have the same appreciation for white! So far now, it remains a dream. But that's okay; I like having a space I can retreat to in my head where its all white and dreamy blues and always looks pristine because, after all, it's in my head!